North Korea is well on its way to becoming a nuclear-armed power, with a dizzying number of nuclear tests and missile launches over the past few years. This has come about despite tightening economic sanctions, international isolation and estrangement from China. This decades-long pursuit has accelerated under Kim Jong-Un, who views nuclear weapons as both the ultimate security guarantee and a critical national project that defines and legitimizes his regime and supports the perpetual mobilization of society . The situation has further deteriorated with the arrival of US President Donald Trump, who has become embroiled in a war of words with Kim Jong-Un punctuated by petulant, personal attacks and threats to destroy one another. While chastising previous administrations’ efforts, President Trump has not articulated a coherent strategy for achieving the denuclearization of the Korean Peninsula, although on several occasions resolutely eschewing diplomatic avenues as a waste of time. However, some in the administration have reportedly advised using military options. These include a preventive strike to destroy North Korea’s nuclear and missile forces or a smaller, coercive ‘bloody nose’ attack against a target of importance – like a missile test site – to signal a willingness to use further military force if North Korea does not relinquish their nuclear arsenal. Any kind of kinetic military operation, especially striking first, is fraught with grave risks and weak assumptions. Can we really keep South Korea and Japan in the dark on a surprise attack against North Korea? Do we expect to eliminate the North’s extensive and dispersed nuclear and missile forces in one definitive preventative strike? It seems foolish to assume that Pyongyang simply assume these attacks are limited in nature, especially given their absence of long-range, early-warning detection capabilities and extreme paranoia about regime change. Do we expect to eliminate the North’s extensive and dispersed nuclear and missile forces in one definitive preventive strike? Even if they do, should we not expect Kim Jong-Un to retaliate in kind. Clearly, in any such response, South Korea and Japan will bear the brunt of such retaliation, resulting in thousands, possibly hundreds of thousands of casualties from North Korea’s substantial artillery and rocket forces and possibly their biological, chemical and nuclear weapons. How would America’s alliances with South Korea and Japan fare after such a catastrophe? And, if the alliances are eroded (if not altogether destroyed), wouldn’t it lead to a greatly diminished US geopolitical presence and authority, to China’s advantage. Given such risks, why would these options be seriously considered? The answer is that North Korea appears on the cusp of possessing a reliable, nuclear-tipped ICBM capable of reaching the continental United States: an unacceptable condition to Washington. The fear is that such a capability will embolden Pyongyang into using ever coercive brinkmanship tactics and possibly military action to aggressively challenge the regional status-quo – including demanding the withdrawal of American forces from the Peninsula and compelling unification under its terms. In such a formulation, North Korea would be secure in the knowledge that Washington will not seriously challenge them for fear of risking a nuclear war that could threaten their own homeland. This condition is known as the Stability-Instability Paradox, referring to stability at the nuclear level (produced by both parties being mutual vulnerable to one another’s nuclear forces) that increases the possibility of limited war pursued by widespread local aggression. As the history of nuclear powers shows, conventional armed conflicts between nuclear states have not been entirely eliminated, evident by the 1969 Sino-Soviet Border Conflict and the 1998 Kargil War between Pakistan and India. But these conflicts have been small in scope – rare events that did not fundamentally alter the existing status-quo. A telling case is Pakistan, which has pursued nuclear weapons to offset a superior adversary but has so far failed to achieve its major territorial revisionist aims. Border incidents and sub-conventional conflict (i.e., terrorism) remain features of Indo-Pakistani relations but large scale conventional conflict has been non-existent. Nuclear deterrence induces caution in both countries, since neither can control what happens after escalating beyond the conventional/nuclear threshold. Pyongyang’s frequent provocative threats and tests could instead be interpreted as signals to deter a preventive military strike on their maturing nuclear force. Limited conventional and sub-conventional attacks have also been a persistent feature of North-South Korean relations. But there has been no noticeably increase in either numbers or intensity of attacks in recent years. We should also avoid interpreting future incidents as radical change, rather than the continuation of routine (albeit destabilizing) North Korean behavior. Arguments that North Korea will act differently, by being an insatiably revisionist actor immune to the logic of nuclear deterrence, fail to take into account similar fears when Russia and China became nuclear. Pyongyang’s frequent provocative threats and tests could instead be interpreted as signals to deter a preventive military strike on their maturing nuclear force. Nuclear deterrence is not simply a policy or military strategy, but more importantly a condition that heavily influences the mindsets and decisions of nuclear states. While still acknowledging human fallibility and error, nuclear deterrence generally acts as a restraining influence based on the acceptance of being in a state of mutual vulnerability. Yet that does not mean both sides have the same potential for coercion. The United States possesses the capabilities to destroy North Korea, but Pyongyang only needs to hold at risk one or two major urban centres in the continental US to possibly deter Washington. Yet this raises questions on how to best deal with a nuclear-armed North Korea. Clearly, the US should avoid undertaking direct military action to try to escape mutual vulnerability with North Korea, as that would almost assuredly lead to a wider war. But it also should also be wary of placing too much faith that military measures – such as a comprehensive cyber-attacks on North Korea’s nuclear and missile command and control system – could somehow reverse the consequences of a nuclear-armed North Korea. Ballistic missile defence (BMD) could provide a modicum of protection against a single and small number of missiles, thus raising the cost of its program, frustrating North Korea’s military planning, and offering some insurance in the event of a worse-case scenario. But even BMD should not be seen as a panacea, lest it lead to an exaggerated belief on its efficacy that increases rather than decreases instability. Otherwise, it could lead to a self-fulfilling prophecy of endless instability and the perpetual, existential specter of full scale war: outcomes associated with allowing North Korea to possess an ICBM force in the first place. Ballistic missile defence (BMD) could provide a modicum of protection against a single and small number of missiles. A nuclear-armed North Korea is obviously not in the interest of the international community and the non-proliferation regime. But it is an emerging reality that we must adjust to. Kim Jong-Un is exceedingly unlikely to give up his nuclear arsenal under any condition and that there is no practical way to disarm him without risking major, possibly nuclear, war. As a result, engagement strategies must shift from the dogmatic purist of denuclearization – something still on display at the foreign ministers meeting on the North Korean crisis recently held in Vancouver - towards building communication channels and a willingness to agree to reciprocal and mutual restraint to ease tensions and reduce miscalculations. It is not, finally, unrealistic that Pyongyang would adopt a less vitriolic, pre-emptive tone as it acquires a more mature and secure nuclear arsenal and appreciates the limited utility of using it as a tool of coercive leverage. Even if it does not, reliance on deterrence and containment have and continue to be the most effective strategies in restraining any possible North Korean revisionist predilections. 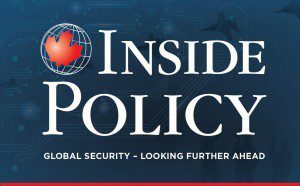 Adam MacDonald, a former naval officer in the Royal Canadian Navy, is a PhD student in the Political Science Department at Dalhousie University whose research interests include political and military developments in the Arctic and East Asia.